Yipes! It's been so long since I have been able to post, but I actually have a non-baby related reason this time: our nine year-old modem finally crashed, so we took the opportunity to switch from DSL to cable. Of course, we had to wait forever for the cable company to come out, so we were without internet for about three weeks (the horror!) Luckily, I had been working on this post before we lost all connection to the outside world. Here is a dress that I finished some time ago. I had a terrible time getting a good picture of it; I don't know if it was because of its dark color or if the conditions were just wrong every time, but I tried on four separate occasions, and these pictures were the best out of about fifty. I had to lighten them considerably in order to show the details, so just try to ignore how washed out the background (and my face!) looks. 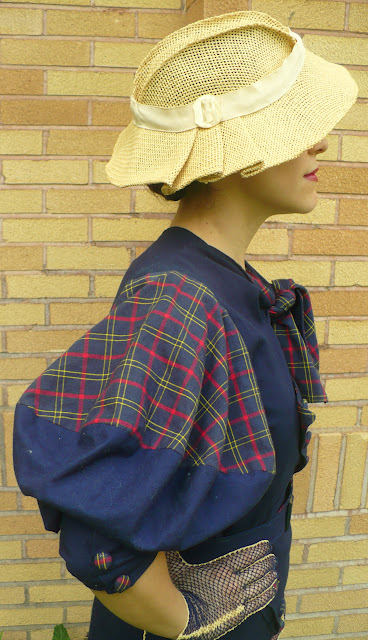 I made it with navy and plaid cotton using this pattern from the Vintage Pattern Lending Library. 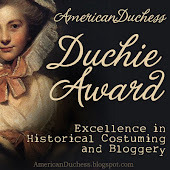 If you haven't already been to this site, you should head over there and do some browsing; they have some really beautiful patterns at very reasonable prices. I made a few alterations from the pattern instructions this time around. 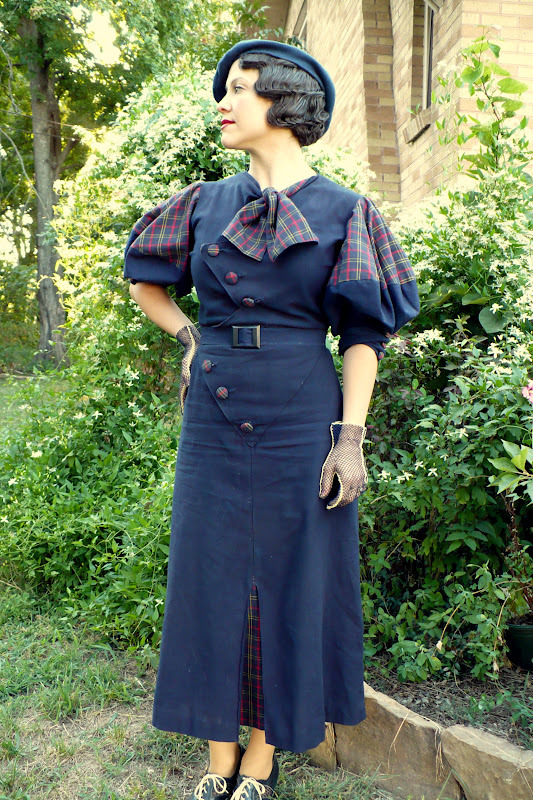 The original dress unbuttons to the waist with the yoke being completely sewn down. 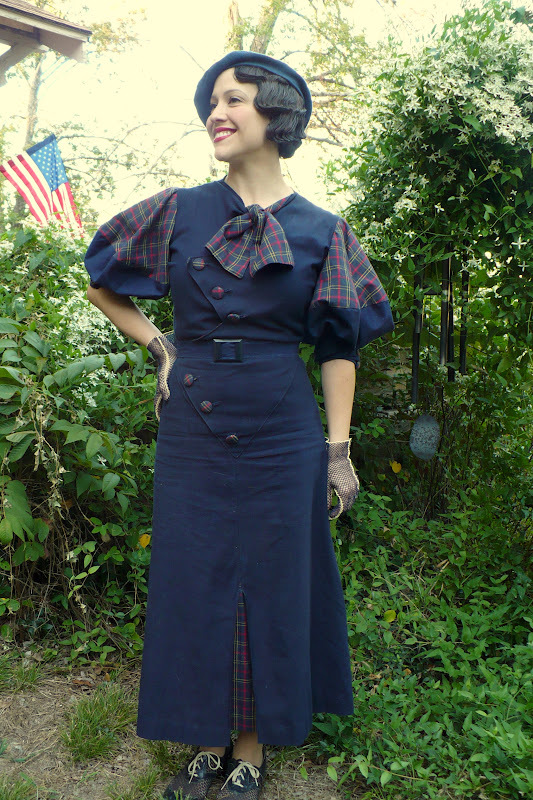 Instead of using the facing piece provided for the bodice, I completely lined the inside with plaid and made it open down to the point of the yoke. I did this because I really wanted to add some extra buttons there for aesthetic purposes anyway, so I figured that they may as well be functional. Also, I had a bit of trouble getting in and out of the first dress, so this helped with that as well. 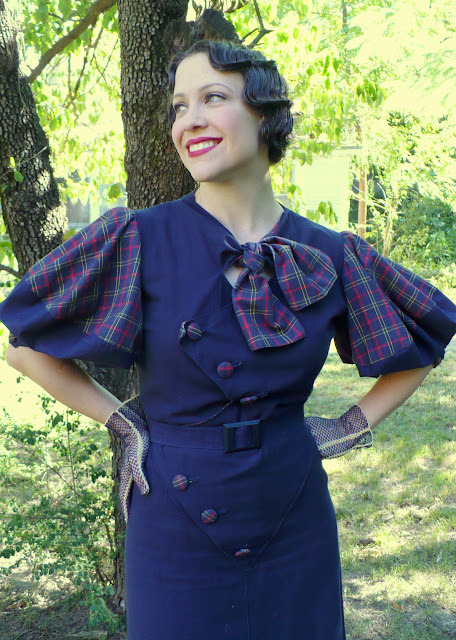 Here is a close-up of the sleeve and some more covered buttons. You know I do love my covered buttons. And of the bodice. I love that the tie can be styled in many different ways. My hair looked similar to that already, except that I added one more wave at the jaw to cover the ear. I also did a center part instead of the side part that I had previously always done. Also, the truth is that I only ever did waves on one side, as the other side was always covered by my hat; the rest I had always just put up in rollers. I really love it; although it doesn't look very different from the (left) side, it looks dramatically different overall. What do you think?